Thank you to everyone who joined us for last week’s breakfast! We are so grateful for your support! Thank you and see you at the Commons! With the arrival of a new year comes the news of our beloved annual Community Breakfast! This year’s festivities will take place on Thursday, February 16th and will feature both familiar program favorites and some fun surprises. 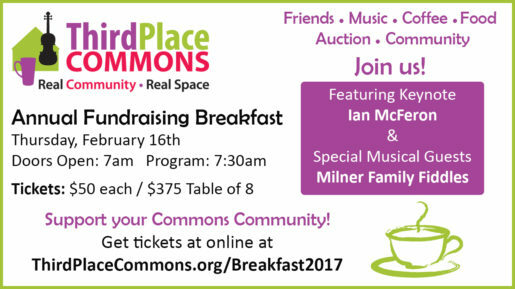 The always lively, fast-paced Community Breakfast is Third Place Commons’ biggest fundraiser, and fun-raiser, of the year – the perfect time to come together as a community and show support for our shared Commons Community! This year’s theme will focus on music and arts programming at the Commons, and especially our youth programming that gives youngsters countless chances to engage, learn, and grow both as audience members and as participants! Ian will also sit in with our wonderful breakfast band, the Milner Family Fiddles! Program ends: 8:29 AM and you’re on your way! Tickets are $50/seat, or bring your friends to a table for 8 at $375. Buy your tickets here! Improv performer Adina Gillett of Jet City Improv will add zing to our morning as our emcee and auctioneer Ross Henderson will join her for a quick, fun auction of a few delightful goodies and nights on the town. But not to worry, we’ll hurry to get you off to your day in good time. Nothing like the thrill of a live, speed auction in the AM to get your blood pumping and get you revved up for a great day ahead! Questions? Email [email protected] or call 206-366-3302. We look forward to seeing you bright and early on February 16th at the Commons! Thank you and see you then!